Framed memorial poster commemorating Captain Donald Sinclair, Sandaig, who was instrumental in saving the crew of the destroyer HMS Sturdy, which ran aground at Sandaig in 1940. He died during a U-boat attack on his merchant ship SS Empire Eland a year later. Hardback book ‘Sailors on the Rocks’ about famous Royal Navy shipwrecks, by Peter C Smith, 2015. Chapter 14 (pg 217) is about HMS Sturdy, which was wrecked on rocks off Sandaig in 1940. 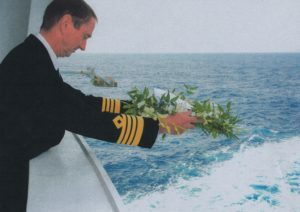 Colour photograph of the captain of the Queen Mary cruise ship preparing to drop a wreath commemorating the wrecking of the destroyer HMS Sturdy at Sandaig during WWII. 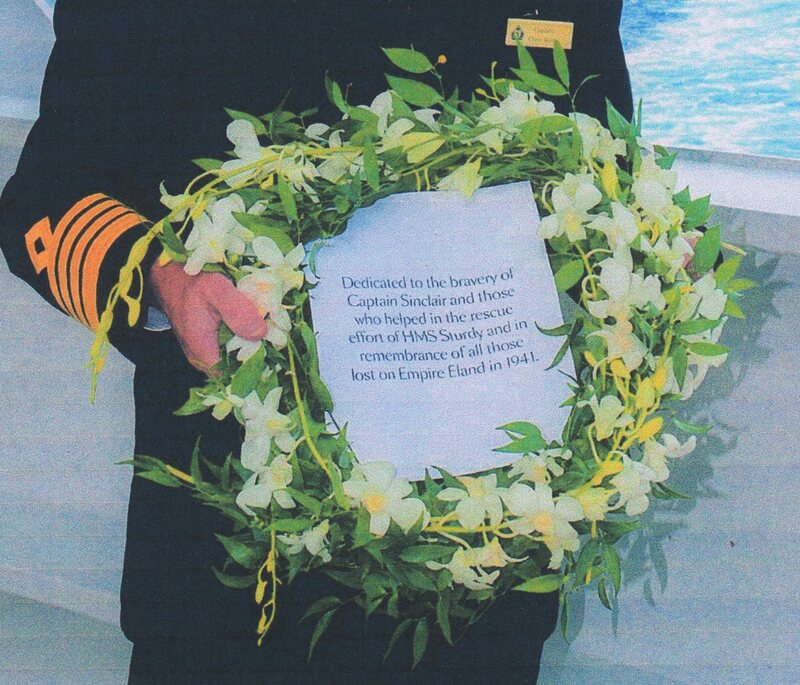 Colour photograph of a wreath commemorating the wrecking of the destroyer HMS Sturdy during WWII. 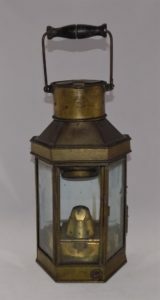 It is being held by the captain of the Queen Mary cruise ship. 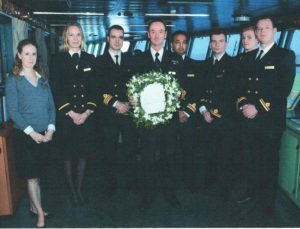 Organised by Commander Michael Gibson of Plymouth, the wreath was thrown overboard in the summer of 2015 as the Queen Mary cruised past the Hebrides. 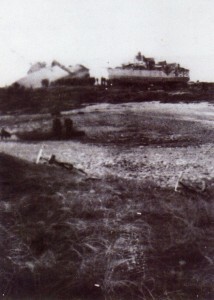 HMS Sturdy foundered on rocks at Sandaig during a storm in October 1940. Five lives were lost, but were it not for the actions of Tiree folk, in particular Captain Donald Sinclair, the toll would have been much higher. 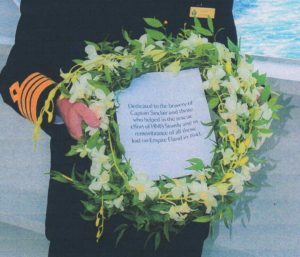 The dedication on the wreath reads: “Dedicated to the bravery of Captain Donald Sinclair and those who helped in the rescue effort of HMS Sturdy and in remembrance of all those lost on Empire Eland in 1941”. 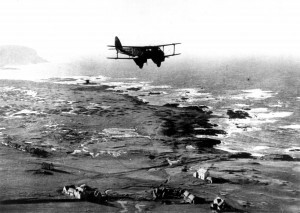 Captain Sinclair was on the Empire Eland when it was torpedoed by a U-boat in the Atlantic. Audio recording of Albert Gallier being interviewed by Dr John Holliday on 11 Oct 2012, about the fatal wrecking of the destroyer HMS Sturdy which ran onto rocks at Sandaig in 1940. 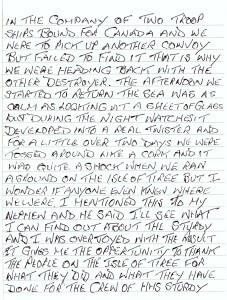 Albert is one of the few surviving members of the crew that were on the ship that night, and recalls his memories of the event. Printed page from the internet about the steam ship Empire Eland (1920-1941), a cargo ship captained by Capt. Donald Sinclair of Sandaig, who was instrumental in saving lives when the HMS Sturdy was wrecked off Sandaig in 1940. 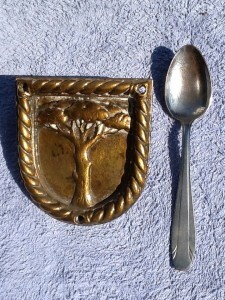 He died when the Empire Eland was struck by a U-boat torpedo in the Atlantic on 15th September 1941. 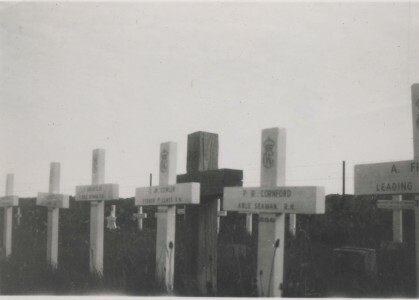 Black & white photograph of the temporary grave markers in Soroby Cemetery of the five crewmen of HMS Sturdy that died when their ship ran onto rocks at Sandaig in 1940.